A family on their adopted part of the Cleveland Way. 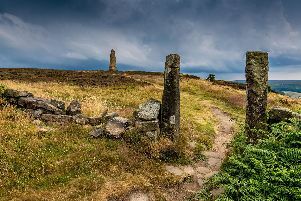 The North York Moors National Park Authority has won an award for an initiative that sees young families become custodians of their own stretch of the National Trail. The park claimed top spot in the Best Project category at the National Parks UK Volunteer Awards 2017, at the Kendal Mountain Festival. A family from Danby, the Beaumonts, who have adopted a 3.4 mile section of the Cleveland Way, from Lordstones to Clay Bank, were at the event. Jacqui Beaumont said: “The scheme has fostered a shared experience for my husband and I and our four children. The Cleveland Way Adoption Scheme involves a year’s commitment to walk, report, survey, improve and enjoy a designated section of the 109-mile National Trail, ensuring it is well looked after for everyone to enjoy. The park scooped a double as volunteer Caitlin McCauley, 19, won the accolade of Young Person of the Year following a summer of volunteering with the education team.